The Hoveton Great Broad Nature Trail is celebrating its 50th year! When Dr Martin George discovered this hidden gem, and created the trail back in 1969, his foresight and hard work really did save something special for future generations. Recognised internationally as a place of Special Scientific Interest, and also as part of the Broads “Special Area of Conservation”, Hoveton is home to some of our country rarest habitats and the specialised species that rely on these wet, woodland environments to survive. 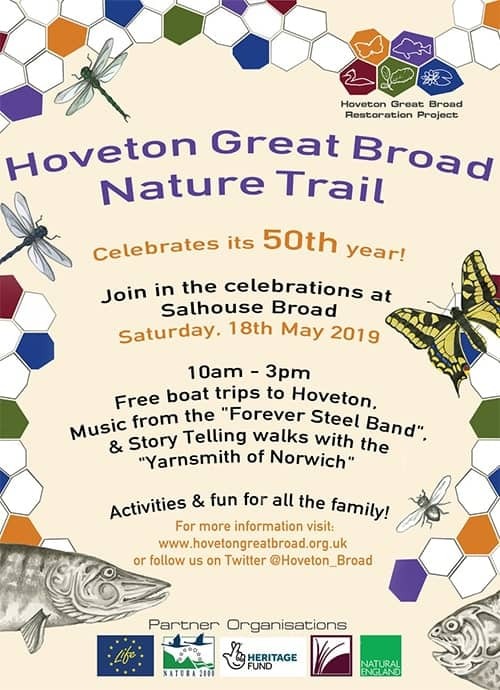 Please come and join us in celebrating the 50th Birthday of one of Englands oldest nature trails, with free boat trips from Salhouse Broad, music and activities for all the family. Bring a picnic, or enjoy food from local suppliers at Salhouse, find out about the restoration project and the work of Natural England, the history of the Broad and why this special place is so important, before taking a trip on the Salhouse Ferry for free to the Nature Trail itself. Our fantastically knowledgable Wardens will be on hand at the trail to give you further insight into this amazing place. The Hoveton Great Broad Restoration Team will be joined by the Water, Mills & Marshes project run by the Broads Authority, The Wherry Charter Trust, the Friends of Salhouse and the Salhouse Team and several other local organisations to make the day a special one for all.